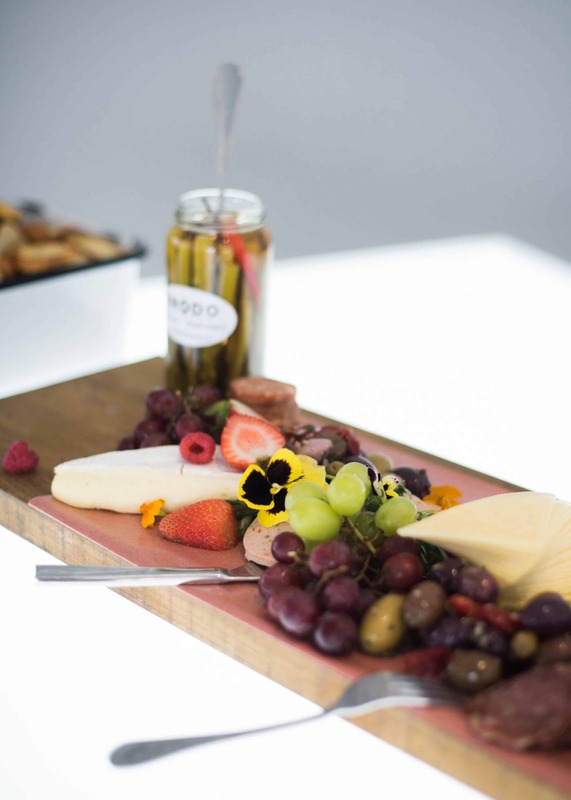 When you can share both deep conversation and late-night eats within a few hours of meeting, you know you’ve found a keeper. 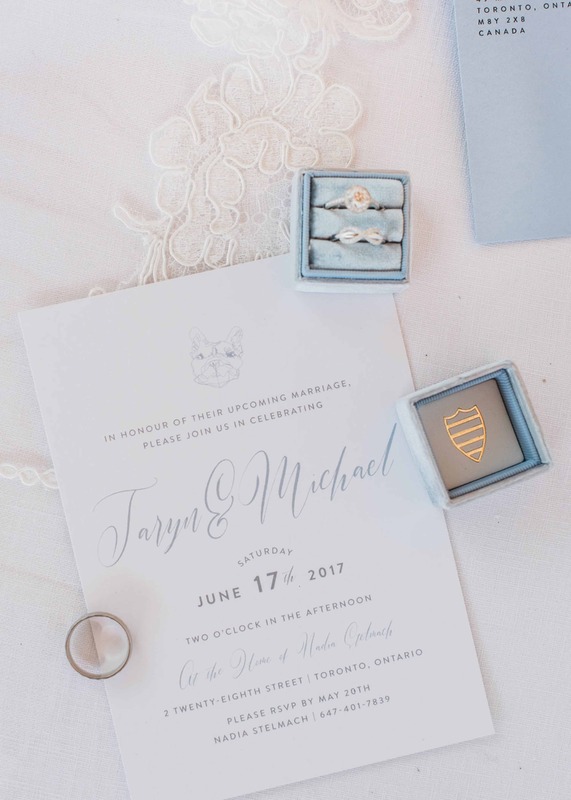 In December 2012, Mike Stelmach and Taryn Lloyd locked eyes across the dance floor at Toronto’s Drake Hotel and immediately connected. 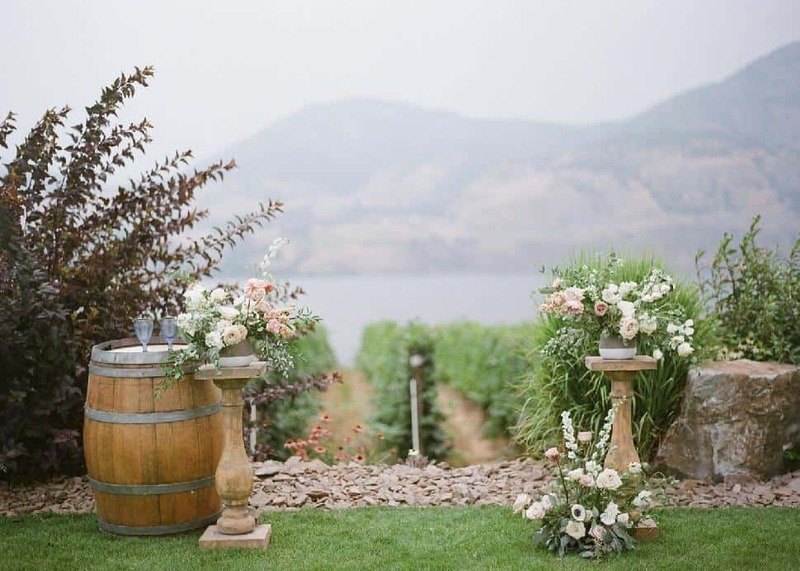 “We had a serious life talk right there at the bar—and then I took him out for poutine with my friends,” laughs Taryn. 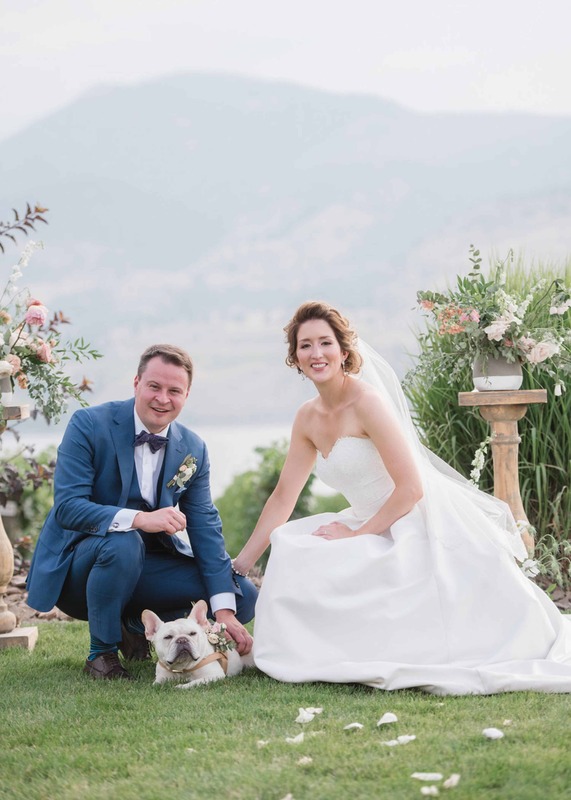 Three years, one adopted French bulldog and a surprise proposal later, the couple started planning for a 2016 wedding. 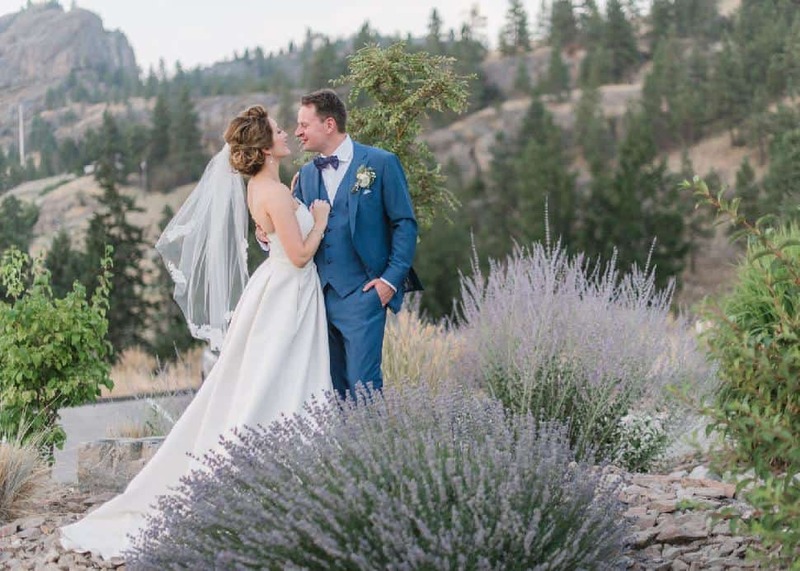 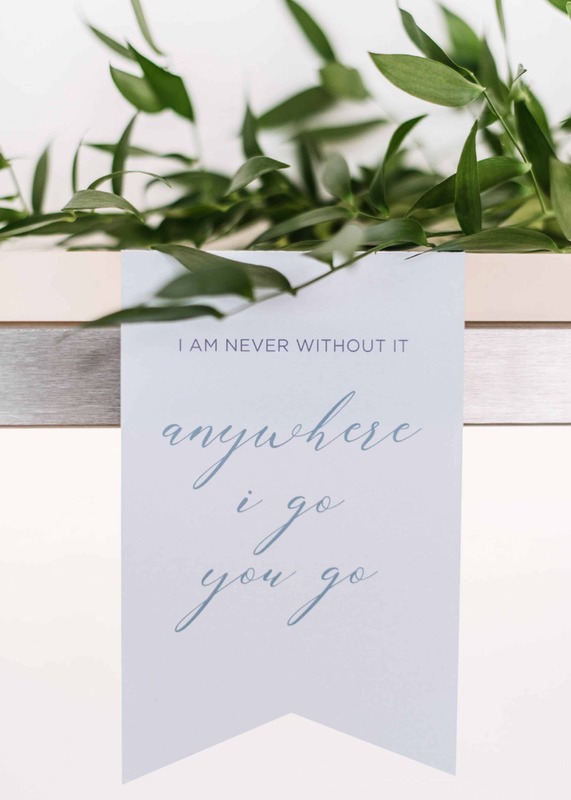 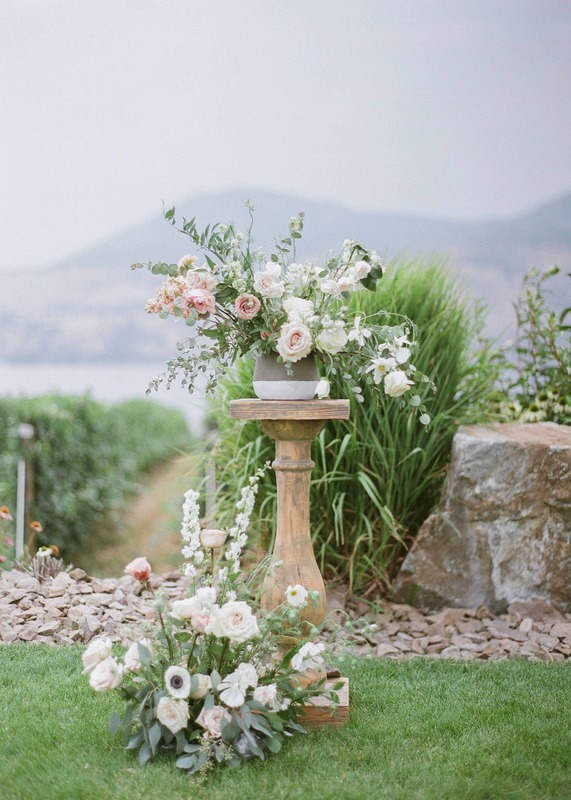 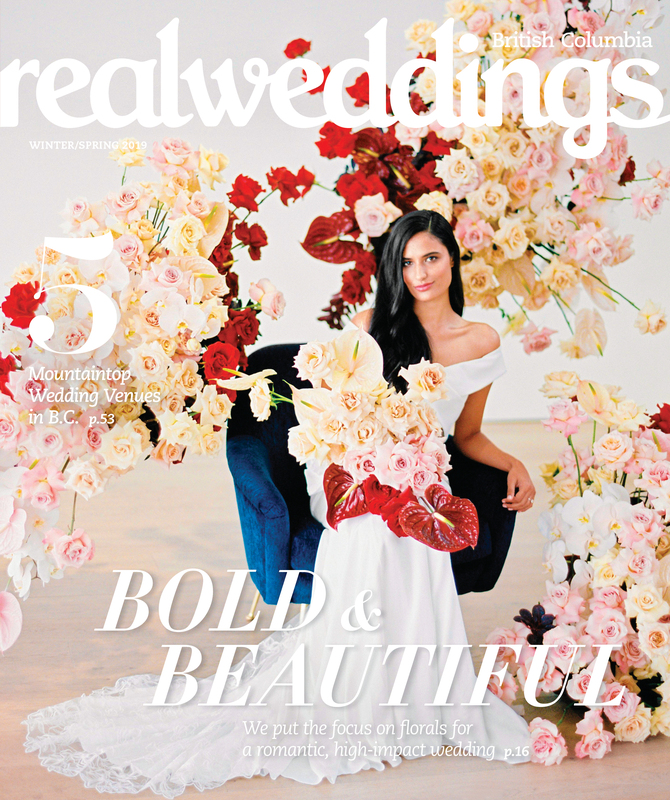 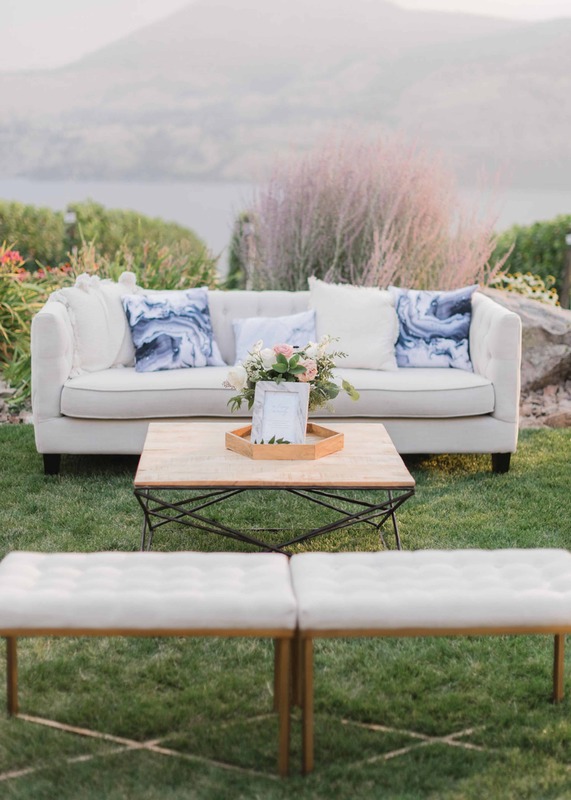 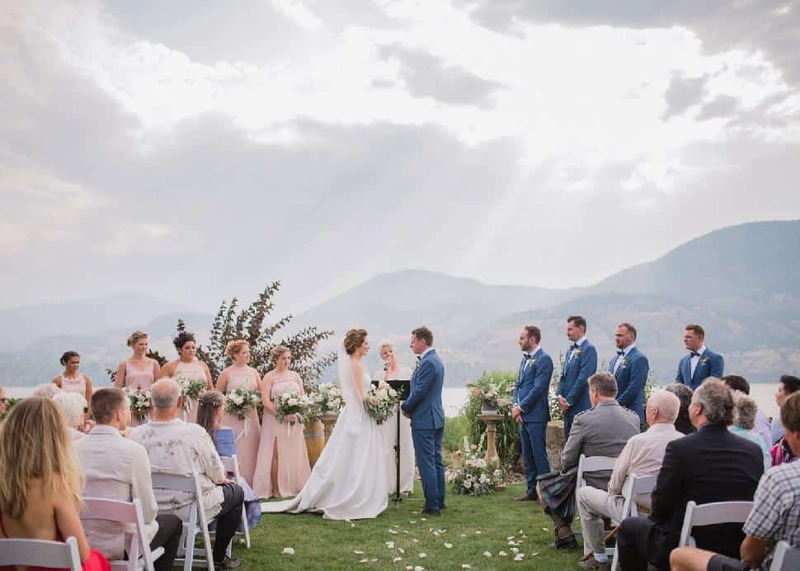 But it quickly became clear that their dream of an Okanagan venue wouldn’t be possible with that timeline—everything had already been booked—so they recalibrated. 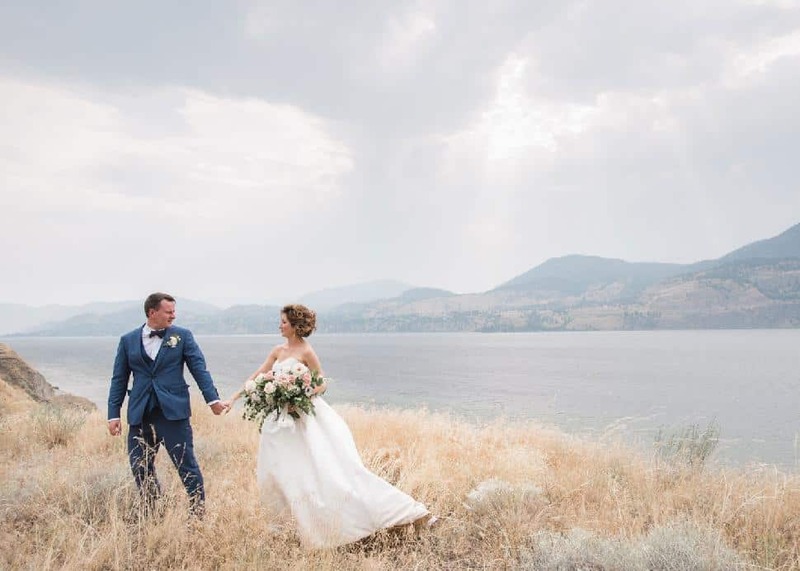 “We decided that we’d rather wait a year and have the celebration we wanted than try to compromise somewhere else...and I’m so glad we did,” says Taryn. 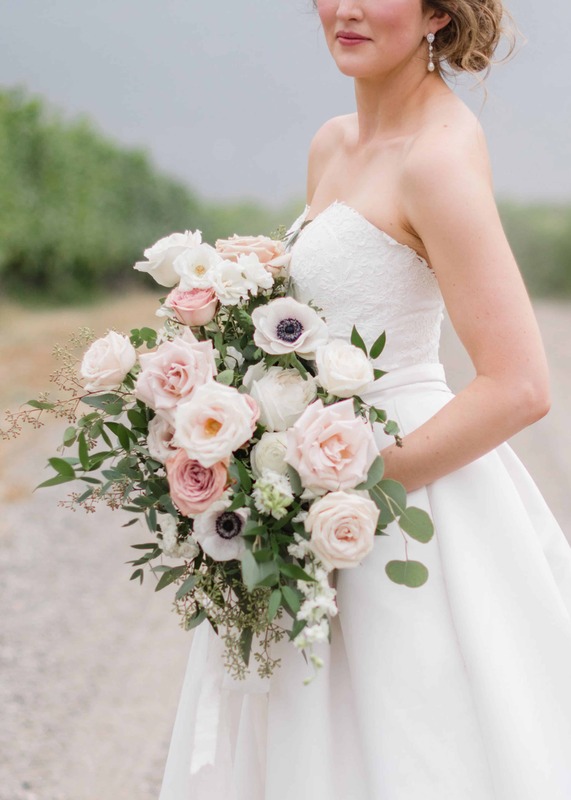 Taryn tried on her full-skirted strapless dress by Toronto designer Barbra Allin at her mother’s request, and surprised herself by loving it immediately. 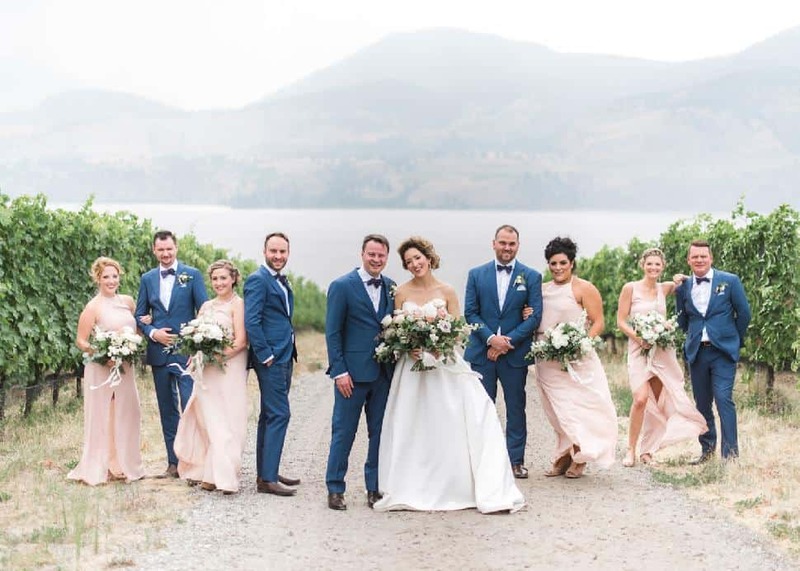 Mike and his groomsmen sourced their bespoke blue suits from The Dirty Inc, choosing breathable fabric that would help them survive the Okanagan heat. 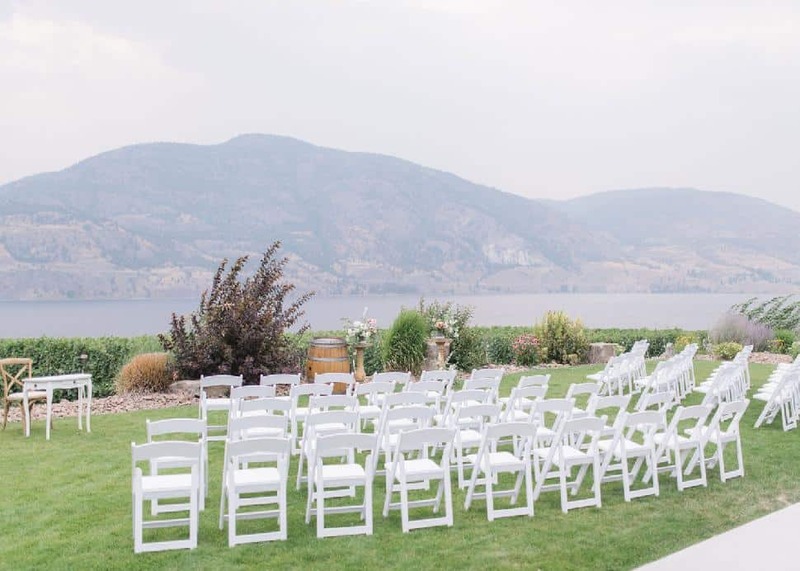 The bridesmaids’ flowing dresses, meanwhile, are Show Me Your Mumu designs. 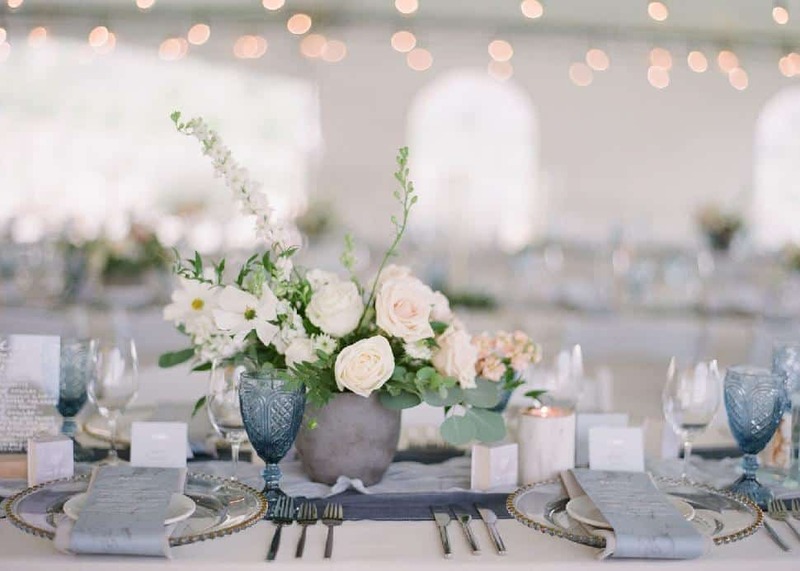 Though Taryn wanted to keep the florals as fresh and local as possible, she couldn’t resist slipping in a request for black and white anemones. 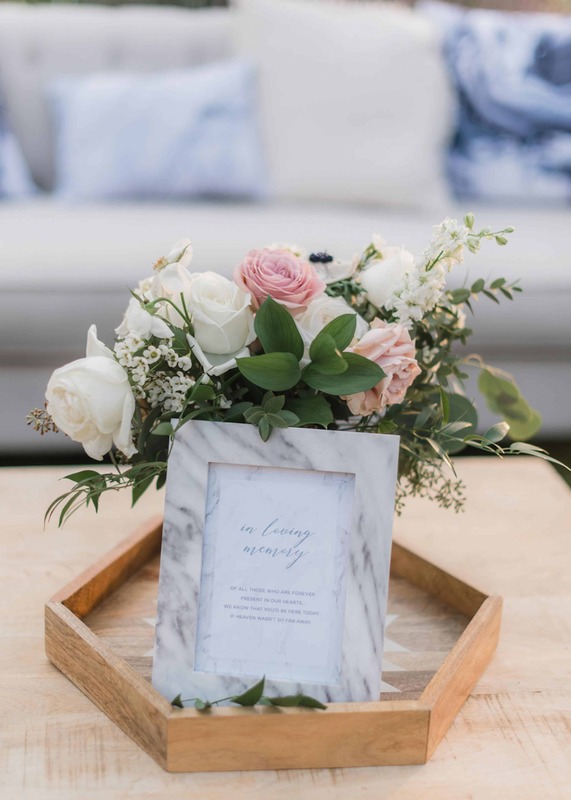 A New Leaf Floral was happy to oblige, adding the striking blooms to both bridal party bouquets and table centrepieces, along with champagne roses, pink roses and elegant greenery. 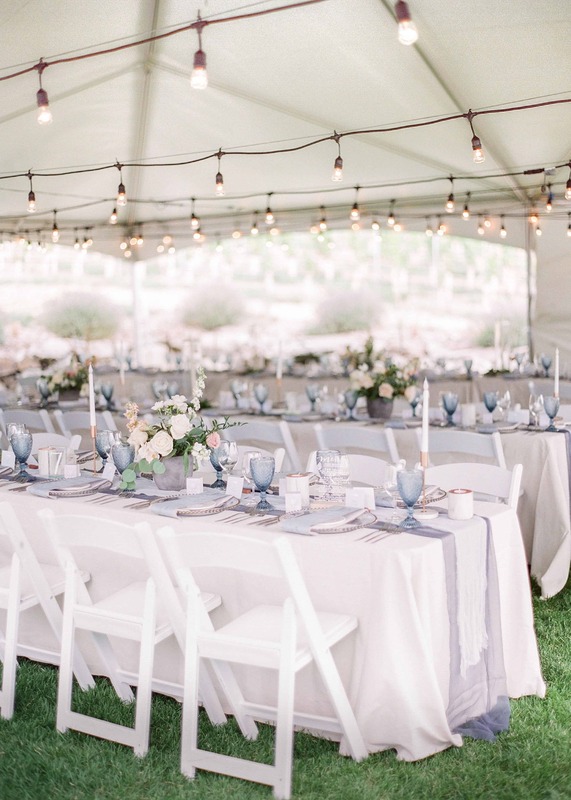 Taryn and Mike dined at a sweetheart table, while guests gathered around three long tables beneath string lights to share a family-style meal. 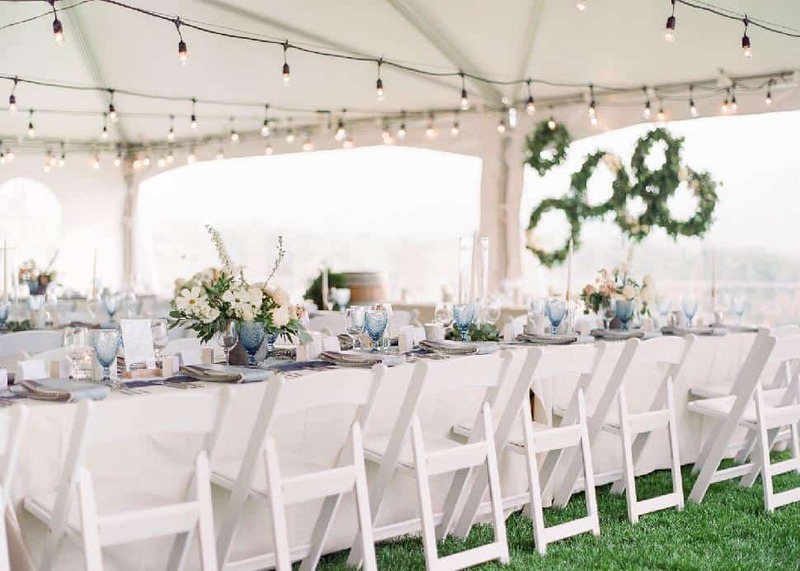 Though the weather cooperated, the wedding planner had clear walls ready to add to the grand white tent in case of emergency. 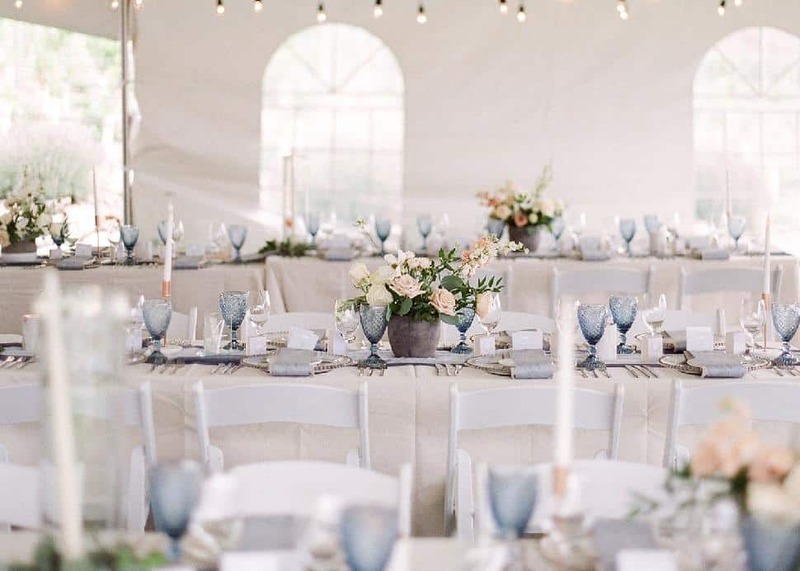 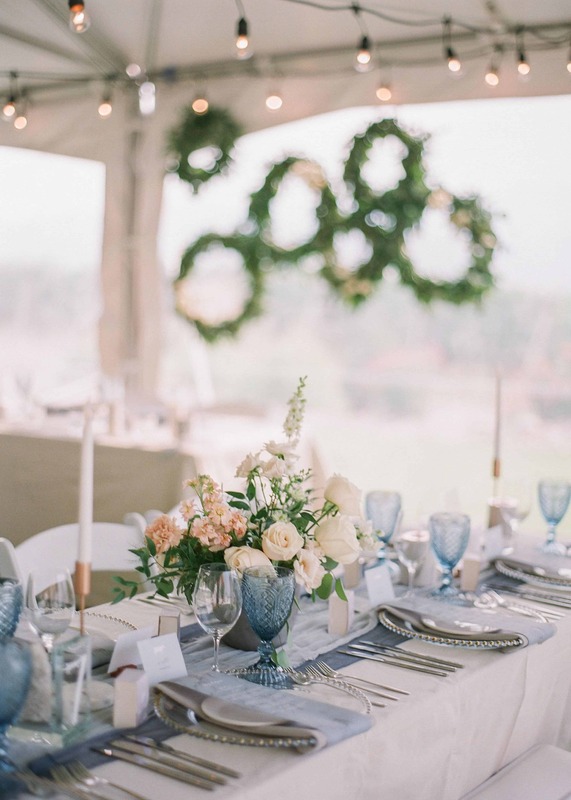 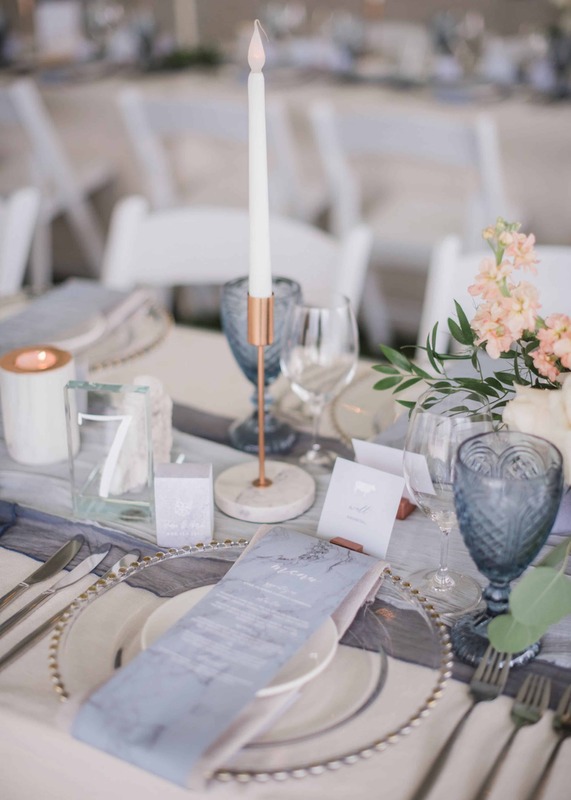 Decorator Yuriko Larson of Vintage Origami layered on flowing chiffon table runners in two different shades of blue, and added scalloped chargers and vintage-inspired blue glassware for a romantic touch. 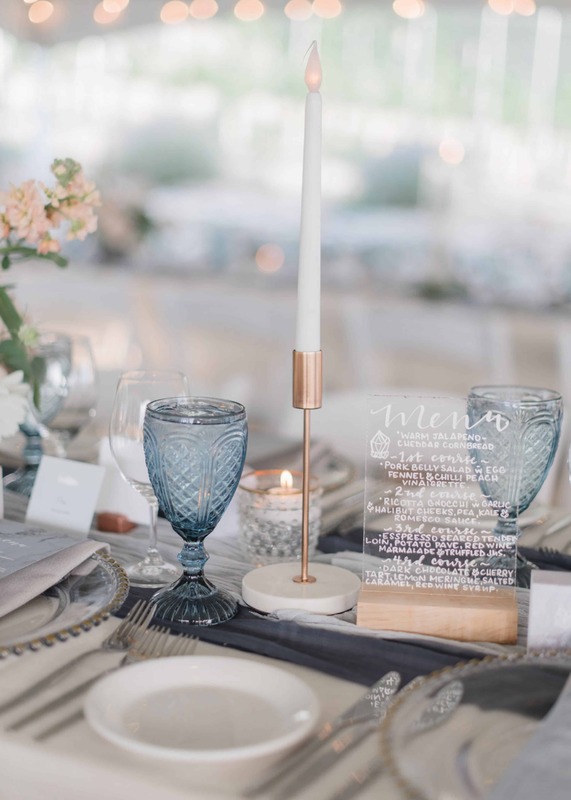 Meanwhile, modern elements like Plexiglas table numbers, white-and-copper votive holders and concrete flower vases added some contemporary cool that aligned with the venue’s sleek architecture. 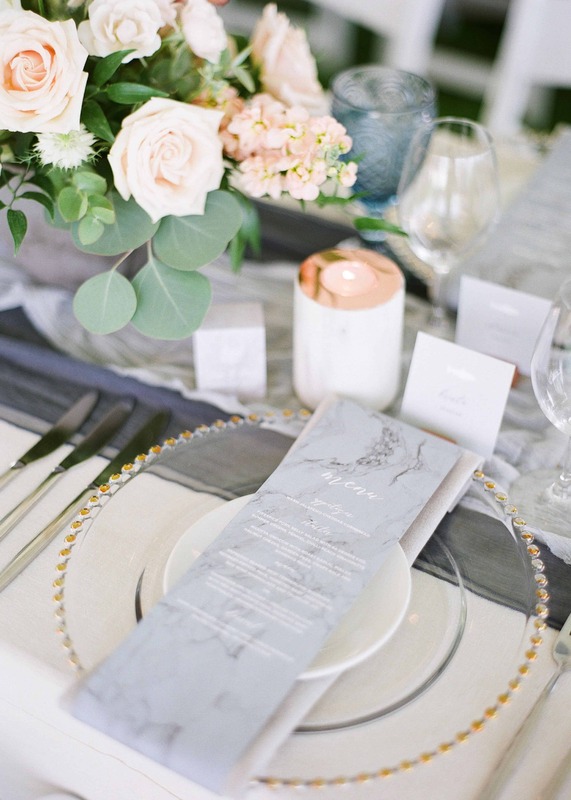 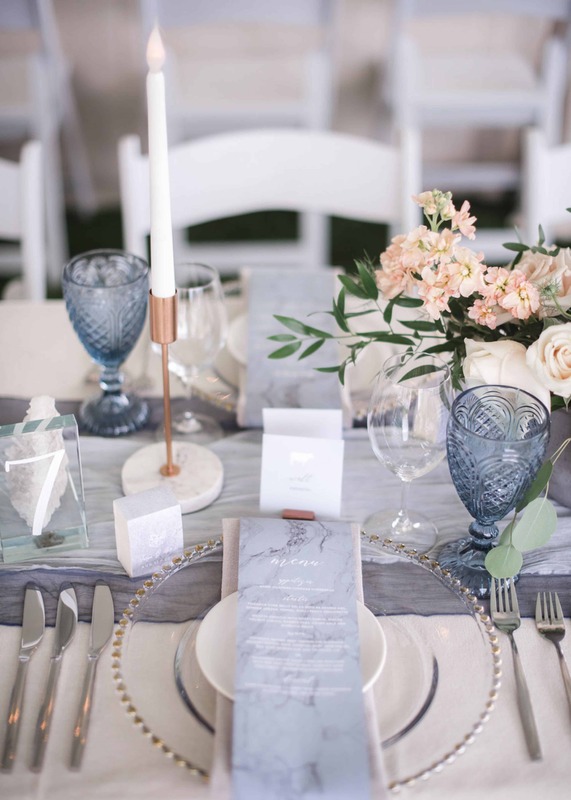 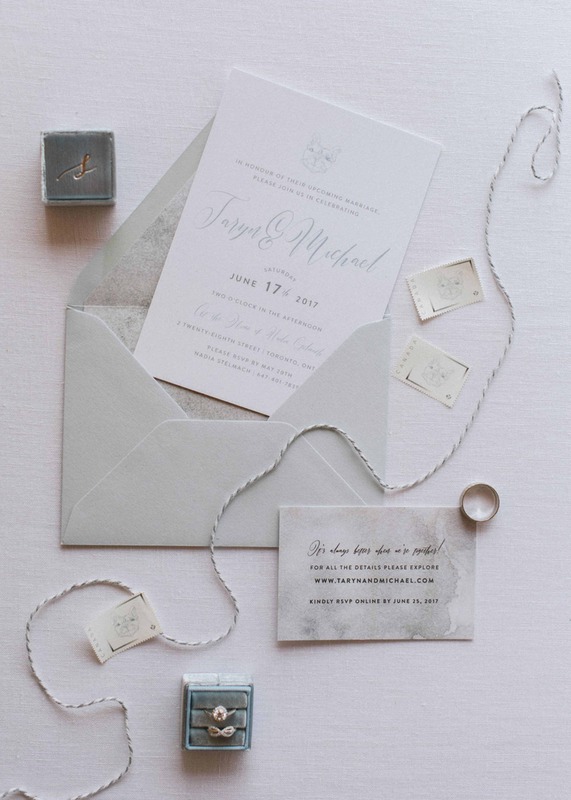 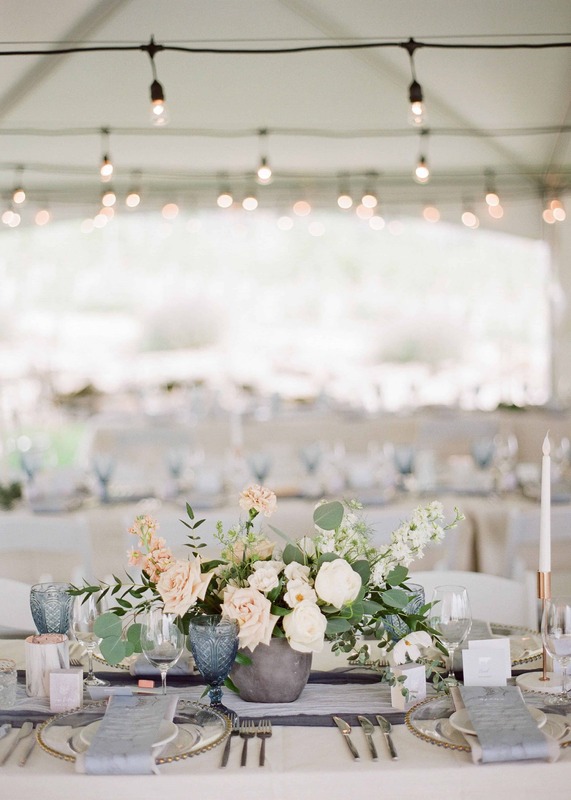 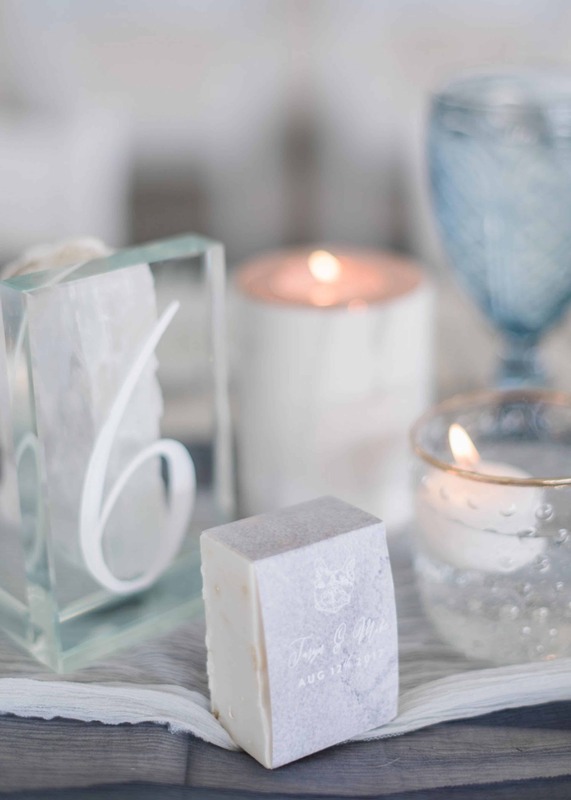 A marble theme was woven through the table decor, from the day-of stationery by Ginger Creative to the custom agate table numbers (featuring calligraphy by A Pinch of Pretty) to the copper-and-marble candle holders. 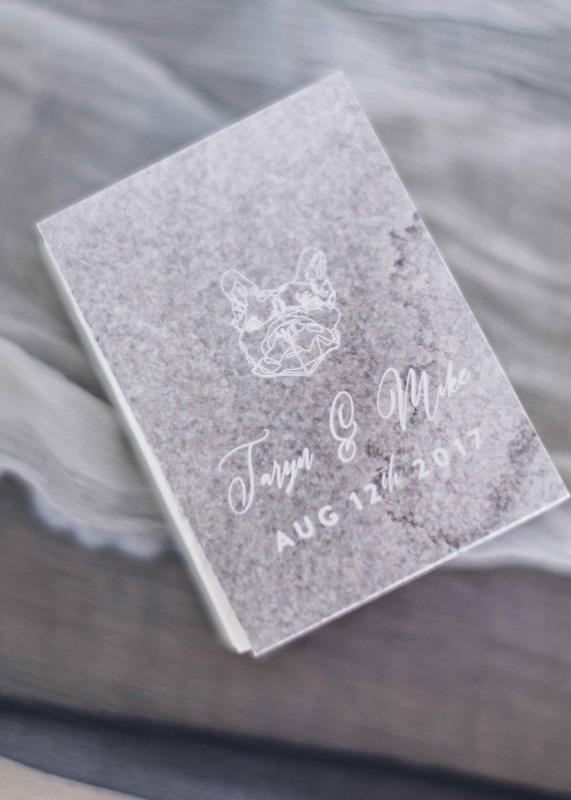 Guests took home custom lavender soap wedding favours at the end of the night, handmade by Studio Soap Co. from local natural ingredients and stamped with Roxy’s adorable mug. 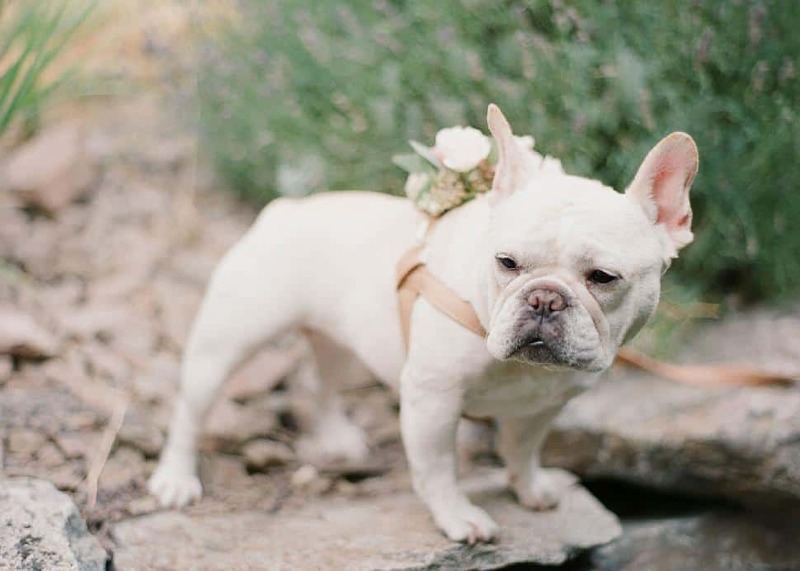 Roxy was also part of the ceremony, accompanying the flower girl down the aisle and looking sharp in a floral harness from The Hound. 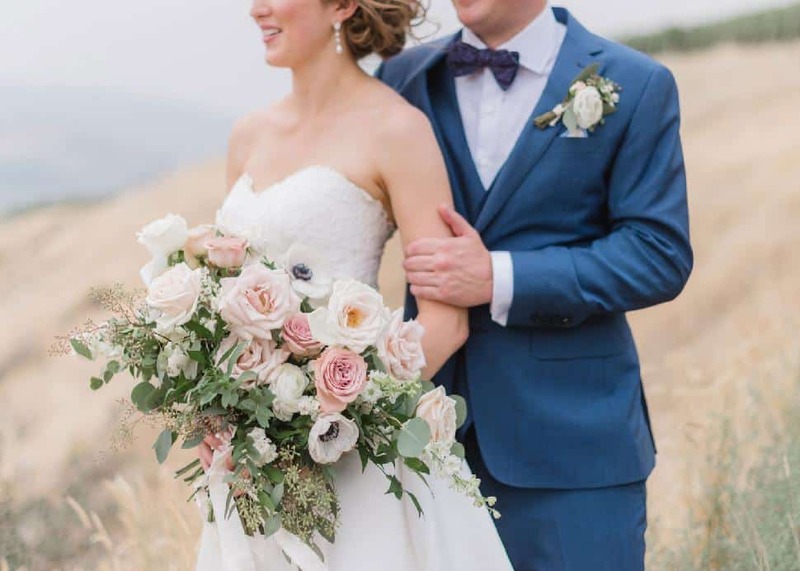 Mike and Taryn are huge foodies, so locking in an amazing menu was key for their big day. 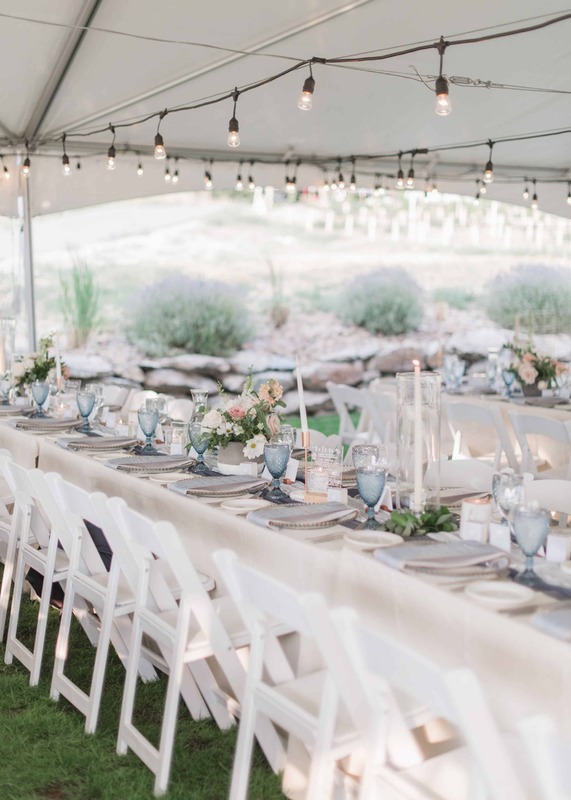 Taste Brodo delivered just that, passing around lamb popsicles, smoked gazpacho and scallop ceviche during the post-ceremony cocktail hour, and serving up a four-course family-style meal that had guests raving.